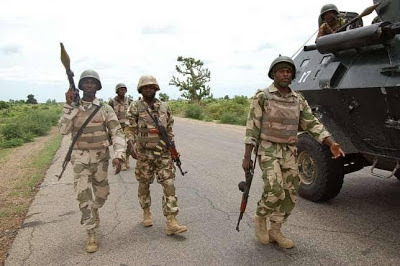 According to a statement by the Acting Director Army Public Relations, Col S.K Usman, suspected elements of Boko Haram terrorists, scavenging for food, attacked Kwang village yesterday at about 5pm. Vigilantes from Dagu (which is about 4 kilometres from Kwang), responded and repelled the terrorists attack. During the fire fight that ensued, one of the vigilantes sustained gun shot wound on his hand and was evacuated to General Hospital Uba while the terrorists fled with gun shot wounds. Troops were eventually despatched to the area with clear orders to pursue and deal with the terrorists. They are still exploiting. Similarly, same day, at about 4.35pm some suspected remnants of Boko Haram terrorists attacked Boftari which is about 15 kilometres from Chibok town. On receipt of the information, troops of Operation LAFIYA DOLE stationed in Forward Operation Base Chibok, mobilized to the area. The troops encountered Boko Haram terrorists ambush site shortly before Kuburmbula village. They quickly cleared the ambush and proceeded to Boftari. Unfortunately, the terrorists had set some houses on fire and fled. The troops put out the fire and are currently on the hunt for the terrorists. It is imperative to state that contrary to rumours flying around some media reports, no life was lost. Additionally, there is no presence of the terrorists in any of the villages talk less of hoisting flags as alleged. The troops have continued to maintain high level of vigilance.